In a digital-first world, the pages on a brand’s website need to be readable for search engines and discoverable for searchers. But how can you ensure your business’s website is optimized for both search engines and users? Your team needs a digital marketing agency to integrate your brand’s search engine optimization (SEO) strategy and content marketing plan to increase your website visibility and boost your digital presence. The strategic combination of skilled SEO implementation and content marketing is one of the most powerful tools your business has to boost traffic to your website and increase your brand’s website visibility on search engine results pages (SERPs). Read on to find out why SEO and content marketing go hand in hand. What’s the difference between SEO and content marketing? 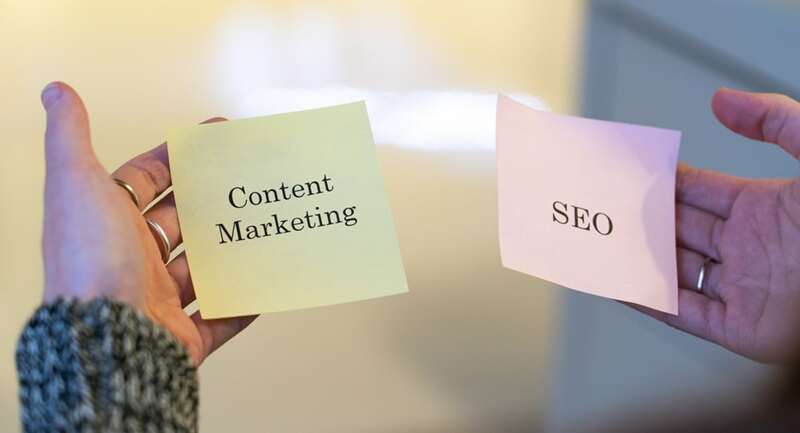 SEO and content marketing are closely related in the way they operate, but each strategy is different in terms of how each approach optimizes a brand’s digital presence and expands its reach. The goal of SEO implementation is to tell search engines what the content on a website page means rather than just what it says. If search engines can understand and interpret a search query more accurately, it can return more significant results to searchers and drive more quality traffic to website pages. The purpose of content marketing integration, on the other hand, is to provide more valuable content to targeted audiences and convert more leads into customers. Valuable content differs for each individual brand personality and branding strategy. For instance, valuable content for one company could mean informative blog posts, while for another, it could mean entertaining infographics or creative web copy. However, one aspect remains the same. The goal of content marketing is to capture the attention of target audiences and attract more potential customers to a brand’s website pages. How does SEO benefit content marketing? While SEO and content marketing have different goals, the two approaches rely on each other to create a digital presence that is just as readable for search engines as it is discoverable for searchers. SEO benefits content marketing goals because it improves the way search engines read website pages. The way a search engine interprets a website page determines the visibility it receives for relevant search queries and how discoverable the content is for targeted audiences. SEO requires the use of keywords, key phrases, linkbacks, and consistent output to make website pages appear on SERPs for relevant search queries and to continue to win. Content marketing is the fundamental component of utilizing these keywords and key phrases and building linkbacks within the pages of a website. Additionally, constant creation of content gives websites consistent output to improve SEO and improves rankings on SERPs. In the market for a digital agency to help develop your brand’s SEO strategy and content marketing plan? Bearpaw Partners is a digital marketing agency in the Atlanta area equipped with a team of the most talented SEO experts and creative content writers who can give your brand an unbeatable digital presence. Let’s work together!